This Acacia wood, chest of drawers is in the style of an antique continental piece of furniture but is in fact fairly new. 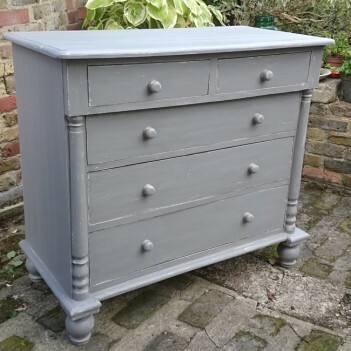 It has been handpainted in Hurricane Grey Vintage Paint, distressed and then varnished. The drawer runners have been worked on so that they are no longer loose and extra supports have also been added.